The shoes will be in a Piccing bag in your suite! AspiringModels is an incredible, exhilarating modeling competition on Stardoll. It's run by Poohg_1993 and it follows the format of America's Next Top Model. There are plenty of cycles, tasks, and of course GREAT prizes! There is also a raffle on-going in which you can win a $25 prepaid card!! I was lucky enough to compete in Cycle 1, and although I did not win, I had a brilliant time! I thoroughly encourage to to join the club today! If you're from the USA click HERE and create a wishlist. Hit Enter and wait until the page loads. Click the "Create My Wishlist" button. Wait till page loads and you can leave the proxy and go to normal Stardoll. The bag should be in a a Starplaza box in your suite. Ιf you are from USA, click HERE and fill out the table as shown further down. Hit 'Enter' and log in to your account. Select one or more items from the list and click 'Create My Wishlist'. 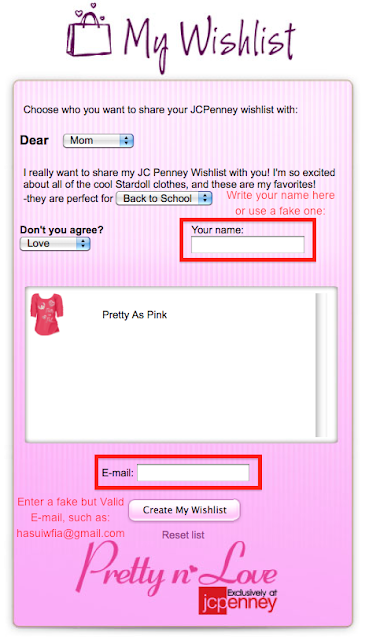 Once the page has loaded, fill in the boxes with fake information, but you have to enter a valid but fake e-mail which has the proper e-mail format (It must have an @ and a .com). When you are done, click 'Create My Wishlist' and wait till the page loads. The shoes should be in your suite.